Finished turns sound simple enough, once we’ve moved onto the next turn we’ve finished the last one, right? Wrong! 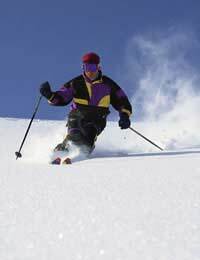 Much of the out of control skiing we see on the slopes can be eliminated by actually completing a full turn, which will also alleviate some fear and promote balanced graceful movements. So how do you know if you finish your turns or not. A few compensating movements expose your secret. First, skidded parallel turns, to check your speed, are an obvious sign. Finished turns regulate speed, not only enabling us to slow down, but also to accelerate. Likewise, skiers who throw their weight to start the next turn expose their unfinished turns by leading with their shoulders. Unfinished turns inhibit the initiation of the new turn, leaving us unset to utilize the forces of gravity and our skis. A-framing in a turn is another symptom of unfinished turns, as a skier leaves the fall line, the new uphill ski skids out. Seeing these symptoms in yourself requires an out-of-body experience or watching a film of you skiing. To fine-tune your turns, some resorts offer workshops that include video training. Learning to finish your turns unconsciously, takes repeated conscious practice. On an easy groomed run, imagine drawing a J with your skis. Ski into the fall line, and then turn your skis until they point back up hill. Repeat this combination in both directions noticing how your knees and ankles bend. Add proper hip and upper body alignment, facing downhill from your hips while your skis turn all the way up hill. Remember to keep your hands up and active. Does the twisting of the hips help you start the new turn? Try to link the finished turns, by adding an extension after the skis have completed one turn. With your hips cocked, the extension should release your edges and allow the skis to slide back into the fall line. We think of turns as S’s down the slope. However, if we imagine linked Cs our turns will be more finished. If a turn consists of the downhill leg, or fall line portion, and two parts going across the hill at the top and bottom of the turn, then including two 45º legs completes the picture of it in our heads. At the start of the new turn, with our skis pointing uphill (more so in our minds, than in reality), extending will move our skis 45º between the horizontal and fall lines. This is the 45º initiation of the turn. Then we ski into the fall line, and back to the horizontal. The other 45º comes at the end of the turn, the uphill part of our J. Incorporating both 45º parts in every turn gives us control and grace in all terrain; it allows us to carve in crud and powder, and whip through the bumps. The transition of the last 45º supplies control and power in the new turn. Eventually you’ll be able to utilize this power to increase your speed for those friendly races to the bottom, as well as check your speed when you come to crowded trail convergences. Great skiers that we watch seem to move their skis back and forth effortlessly, yet when we try to imitate them, we feel out of control. Analyzing their movements in slow motion will show finished turns that set them up for effortless transitions. Practice on easy runs until it becomes second nature. When you get on a steeper pitch or into ungroomed conditions, you may need to focus again on those 45º’s.